News drives our industry. Staying informed of trends, technology, business moves, legislation and statistics is vital to success in the fast-paced security market. That's why your key prospects turn to Security Systems News to help them do their jobs better. Make the best investment for your marketing dollars by taking an integrated approach—print, online, and face-to-face events—with Security Systems News. Security Systems News is a monthly business newspaper that reaches 24,100 security installers, product distributors, central stations, engineers & architects, and security consultants. 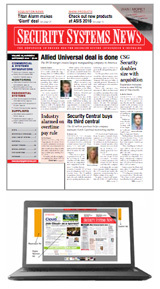 Our editorial coverage focuses on breaking news in all major segments of the security industry such as market trends, new products, new technology introductions, and news about manufacturers and suppliers. Fully-interactive online replica of the monthly print issue with customizable features. Click here to view the issue. Our popular website reports the news as it happens for the entire industry. Your prospects visit on a daily basis. Make sure your ad is seen by decision makers as they access critical information vital to their success. Generate leads and reinforce your brand by sponsoring these popular, targeted e-newsletters. Our lists are managed to ensure the emails go SSN subscribers who engage with us. Focus by Security Showcase is a dedicated broadcast email that delivers your custom message to an audience of your choice. This unique opportunity allows you to reach security professionals with buying power, without other advertisers' materials in the email. Drill down into our extensive audience to target exactly who you want to reach. Our extremely popular weekly broadcast email keeps readers fully informed with breaking news and relevant stories crucial to the industry. Two sponsorships available: Primary and Secondary Ads can be graphic or text and are clickable to your provided link. Click here to subscribe now. Be connected with the hottest news. Sponsoring the SSN Breaking Newswire allows you to engage readers as they access vital news, as soon as it happens. The package includes exclusive sponsorship of five editions. The Top 5 monthly e-newsletters focus specifically on stories in the Access Control, Commercial Integration, Finance, Monitoring & Residential & arenas. These emails keep readers up-to-date on stories they may have missed in their specific field. It also gives you an opportunity to target your message directly to prospects with an interest in your product and/or service. Two ad positions available per email: Skyscraper ad and text only ad. Click here to subscribe now. Security Showcase is an email broadcast that presents security product solutions to an audience of integrators, dealers and end users. Showcasing your product is an extremely cost-effective way to generate leads and build product awareness.